Badluck Way, the Story of a Man, a Wolf, and Their Ultimate... Bryce Andrews: What Are You Reading? One way to say how I ended up on the Sun is that my life in Walla Walla, Washington, where I’d stacked basalt, poured concrete foundations, and waited for a girl to finish her last year of college, ended. The door slammed shut and I just kept moving, out of desperation more than anything else. I went home to Seattle, slept on the floor in a friend’s house in Fremont, and knocked around miserably in bars. Then I joined up with another buddy, who lived on a sailboat that was thirty years old and twenty-eight feet long, and sailed that tub up to the San Juan Islands in a January storm. I was at the helm when the boom snapped in half and threw us broadside to the swells. As I fought the wheel and Bill cursed his rickety diesel inboard motor, I thought about how small the warmth of my body was and how endless the chill of water. I thought of how things thrown in the ocean sink down beyond the reach of the sun. Waves broke over the bow and it was raining so hard that I breathed through my nose to keep from choking. In spite of oilskins, rubber boots, a plastic hood, and neoprene gloves, I was soaked to the skin. When the motor finally kicked over, Bill folded the sail into a packet no bigger than a bedsheet, and we limped against the storm back toward Port Townsend. Veils of rain hid the Olympic Peninsula, so it seemed the world was made of only water. I tasted the ocean. It flooded my eyes. I watched it rise into jagged topographies that passed like mountain ranges on the move. When we docked, I had to pry my hands from around the wheel. I stepped onto dry land and thought: Enough. Getting lost was easy. One day I went down to the Amtrak station and slid out of Seattle on a pair of steel rails, traveling three unwashed days down the coast to San Diego, where I surfed poorly and did chores for my grandparents. My grandfather was on the mend from his first go-round with cancer. Though we couldn’t walk the beach together, he was optimistic when he left me at the station. I took trains that rattled across the Southwest: Phoenix, Tucson, San Antonio, and a hundred map dots in between. I got a hotel room in New Orleans for my twenty-third birthday, did what everyone does there, then ran north to get away. From D.C. and New York to Chicago, where clinker ice hissed against a concrete breakwater, I was quick and free. My feet had barely touched the ground since California. I bought a southbound ticket and one week later crossed into Juárez, Mexico, in the middle of the night. It makes a difference when your money runs out, especially in Mexico. I ate tacos of dubious provenance, scraped through the twisting innards of the Copper Canyon, and hitchhiked up Baja in a propane delivery truck with no starter and no brakes. After crossing back into the States at Tijuana, I spent three days retching in my grandparents’ bathroom, and went home to Seattle feeling as though I could handle just about anything. I looked for work, and the first good thing I found was a summer ranch job. That’s one way to explain how I got to the Sun. Another way to say it is that, ever since I can remember, I’ve been obsessed with the West. I grew up in Seattle, the son of a professional photographer and an art director. My father started running the University of Washington’s art museum when I was four and kept the job for twenty years. He must have had a touch of my own mania, because when I was seven he organized a show called The Myth of the West. While the curators installed it, I played with balls of wadded masking tape in front of Albert Bierstadt’s lightsoaked picture of Yellowstone Falls and practiced my quick draw facing Andy Warhol’s duded-up Double Elvis. Dad brought home crowds of artists from work to eat at our long kitchen table. I was six when Pat Zentz came to dinner and kept everyone up with stories until night gave way to morning. In Seattle’s art scene, Pat was something different. He hailed from a ranch outside of Billings: a two-thousand-acre spread of dryland wheat, old homestead buildings, Black Angus cattle, grass, and sky where he built sculptures and worked like hell to keep from losing the land. One of these summers, Pat said, we should come out and see it. Our first visit to the Zentz Ranch, when I was seven years old, lasted only a couple of days. We pulled spotted knapweed with Pat, his wife, Suzie, and their three boys and helped move a few cows on horseback. My mother photographed every skeletal cottonwood and disintegrating outbuilding she could find. On the last evening, we drove out to a high bluff that Pat called Martini Ridge and watched the sky grow dark above the Crazy Mountains. Emergent stars seemed closer than the horizon. When we left I pressed my face to a dusty backseat window and cried. I came back the next summer—stayed longer, worked a little bit harder, got paid two bucks an hour. I learned to roll up rusty, ground-bound strands of barbwire. In the summers that followed, I built fence, fixed fence, moved cows, and learned how to catch and tack a horse. I drove a 1978 GMC High Sierra on tracks so rough my forehead smacked the steering wheel. When the work was done I lay faceup on the truck’s roof looking into the deep blue bowl of the sky. Thunderstorms rose in the southwest, raged a short while, and then blew east to die in the Badlands. The smell of wet dirt followed. Every summer until I turned eighteen, I returned to the Zentz Ranch to work for nothing, or next to nothing, finding recompense in the little calluses on my palms. Whenever I went home to the damp claustrophobia of Seattle, I would dream about big, dry, lonely country. I pictured it each time I bought a ticket to anywhere or filled up the gas tank on my truck. After returning from Mexico, when I sat down in front of my parents’ computer to look for a job, I could not put the idea of ranching from my mind. I found a job announcement on the Montana State University website. The first paragraph read: The Sun Ranch is located on the edge of the Lee Metcalf Wilderness, in the upper Madison River Valley of southwestern Montana, about 30 miles south of Ennis. It encompasses approximately 25,000 acres of deeded land and grazing leases. The Ranch is committed to conservation and improving the health of the land for wildlife and livestock through progressive management. I did a little research and found that the Sun Ranch straddles one of the most important wildlife corridors in the Greater Yellowstone Ecosystem, providing habitat for grizzly bears, wolves, lynx, and wolverines. Elk herds numbering in the thousands move across it. The ranch was at the vanguard of a movement to rethink the way agriculture is practiced in the West. Large herds of yearling cattle grazed the ranch each summer. The movement of these heifers and steers across the landscape was carefully choreographed to complement, rather than hinder, the systems of the wild. Simply put, the idea was to integrate ranching into a functional, natural ecosystem. The Madison Valley, and especially the south end of the Madison Valley, was my father’s fishing heaven. He’d taken me to the river as a teenager, and we’d leapfrogged up the pocket water near Three Dollar Bridge. From my time on the Zentz place I knew a bit about the work described, the fencing and herding, anyway. I had gumption, or thought I did, so I called about the job and was hired. On my last morning in Seattle, I packed the back of my truck with jeans and work shirts, a few cooking utensils, sheets, and food that would keep. I scuffed my cowboy boots against a curb so they wouldn’t look brand-new and drove out of the city on wet streets, weaving through the morning rush. Interstate 90 led toward the west slope of the Cascades. Ahead the clouds snugged down around Snoqualmie Pass and its attendant peaks like a gray skullcap. The forest pressed in from either side of the freeway—firs, cedars, and elephantine blackberry tangles. I charged up and over the pass. The walls of greenery blurred and then, somewhere after Cle Elum, disappeared. I had practiced this departure many times, and as the irrigated fields and scrubland of eastern Washington unfurled in all directions, everything felt right. I was headed away from my youth and home, a place where the clouds spat water through a lush, evergreen canopy. Ahead, the horizon was wide and empty, and the sky a clear blue. I was eastbound toward the West, to become a ranch hand in the high country of Montana. I never even glanced at the rearview mirror. I sped through wheat fields and orchards, slept in a ratty Coeur d’Alene motel, and crossed into Montana by way of the Idaho Panhandle. By four in the afternoon I was at the foot of the Norris hill. If the Norris hill were someplace flatter than southwest Montana, it would be considered a mountain. Here, though, it’s unremarkable, and probably wouldn’t even merit a name if it weren’t for the fact that Highway 287 climbs it to a saddle from which the whole Madison Valley is visible. The view on the far side is distracting enough to cause a wreck. I pulled to the edge of the road to take it in. Two mountain ranges strike south from the hill, keeping roughly parallel to each other. In the foreground they are at least ten miles apart, but farther off the ranges bend inward, pinching off the valley like an hourglass waist. Though the valley is symmetrical in shape, the mountains that flank it could not be more different. On the east side, the Madisons leap suddenly toward the blue sky. Sharp, sheer, and rocky, at first glance they seem to cant forward and overhang the valley slightly. My map named some of the peaks: Fan, Helmet, Sphinx, and Wedge. From the top of the Norris hill they look like a solid wall with broken shards of glass along the top. The map also named a few of the Gravelly Range’s westward mountains, but I could not match them to the landscape. While the Madisons form a line of glinting canine teeth, the Gravellies are a many-shouldered swelling of the earth. The fallen-down range humps up from the floodplain grass, rising into a maze of timbered ridges, flecked from bottom to top with open meadows of various sizes. Rangeland begins where the foothills end, and the valley is wide enough to hold an ocean of grass. From atop the Norris hill, the landscape resolves into a series of descending benches, regular enough to look from a distance like a massive green-carpeted staircase connecting the mountains to the river. The most striking part of it all was the Madison River, which reflected the afternoon sun and drew a golden line through the heart of the valley. Curving smoothly across the floodplain like a snake navigating stony ground, the river issues from the south and is flanked on either side by dark thickets of willow. Traffic roared behind me, pulling my attention back to the early-season tourists and long-haul truckers topping the hill and accelerating down into the valley like roller-coaster cars. A little convoy of them dropped out of sight on a curve and reappeared on the far side of the town of Ennis. After Ennis, the highway crosses the Madison and veers south, running straight toward a little smudge in the grass called Cameron, population forty-nine. According to my map, Cameron was fifteen miles from Ennis, and the Sun Ranch fifteen miles farther up the road. I stared south, following the twists and turns of the Madison River upstream to where the mountains squeezed in tight around it, trying to imagine how the ranch lay upon the land. When I arrived on the Sun for the first time, Jeremy was standing in his front yard, waiting. For a long time I wondered how he had pulled that off, since I had given him the day, but not the time, of my arrival. No doubt he’d heard my truck clattering over the frontage road washboards or seen a dust trail rising. At any rate he was ready and I found him leaning against a low chain-link fence, looking like the boss in a broad straw hat and a sun-faded blue shirt. “Glad you found it,” he said, and shook my hand. I thanked him for taking a chance on hiring me, and he laughed like I had told a good joke. Up close, Jeremy looked younger, almost baby-faced except for a light goatee and a pair of round photosensitive glasses. Under the high April sun, those glasses turned dark enough to hide his eyes entirely. We talked in the yard, orbited by a pair of black border collies. Sometimes the dogs trotted up close to measure me with quick, inquisitive sniffs. Jeremy took me on a walking tour of a cluster of buildings adjacent to his house. We looped through a machine shop, corrals, and a handful of old livestock sheds in slump-roofed subsidence. Because of the eponymous stream that ran behind these structures, the little settlement was known as Wolf Creek. In addition to the compound we were walking through, there was another clump of buildings in the dead center of the ranch, which included the owner’s house, an old barn, the ranch office, and a sheet-metal building full of heavy equipment. Those constructions were scattered along a watercourse of their own, and were therefore called the Moose Creek buildings. As we passed the various ranch trucks, parked in a neat line, Jeremy pointed at a massive white one-ton flatbed Ford. He left me at a low wooden bunkhouse, not far from the machine shop, with instructions to get settled in. This reading group guide for Badluck Way includes an introduction, discussion questions, and ideas for enhancing your book club. The suggested questions are intended to help your reading group find new and interesting angles and topics for your discussion. We hope that these ideas will enrich your conversation and increase your enjoyment of the book. 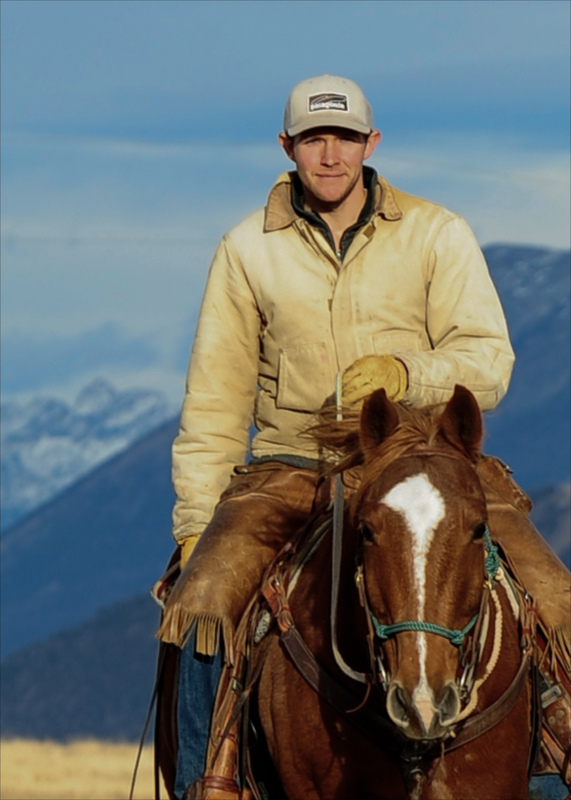 After some postgraduate wandering, Bryce Andrews fondly recalled his boyhood and teenage summers spent on a Montana ranch where he would proudly “work for nothing, or next to nothing, finding recompense in the little calluses on my palms.” Those memories inspired him to apply for a seasonal job on a sprawling Montana ranch near Yellowstone National Park—a conservation-minded spread where livestock grazed beside a vast and seldom-traveled wilderness. Soon, Bryce’s days are filled with the physical demands of managing hundreds of cattle upon thousands of acres. At the margin of his busy, pastoral world, a pack of wolves trots through the foothills and high valleys of the Madison Range. Once on the brink of extinction, the American gray wolf’s numbers surged back in recent years, bringing relief to environmentalists and others passionate about wild creatures. For ranchers like Bryce and his colleagues on the Sun Ranch, the wolves present a much more complex set of issues. Though the ranch abounds with elk, deer, and other wild game, the wolves begin stalking the herds and regularly killing heifers. The ranch crew struggles to protect their stock and livelihood, sleeping in pastures and using noisemaker shotgun shells to deter the wolves. When nothing seems to work and the ranch hands shoulder their rifles in earnest, Bryce’s life veers into a moral gray area as he considers the necessity of striking back at the wolves while respecting their natural inclinations as predators. 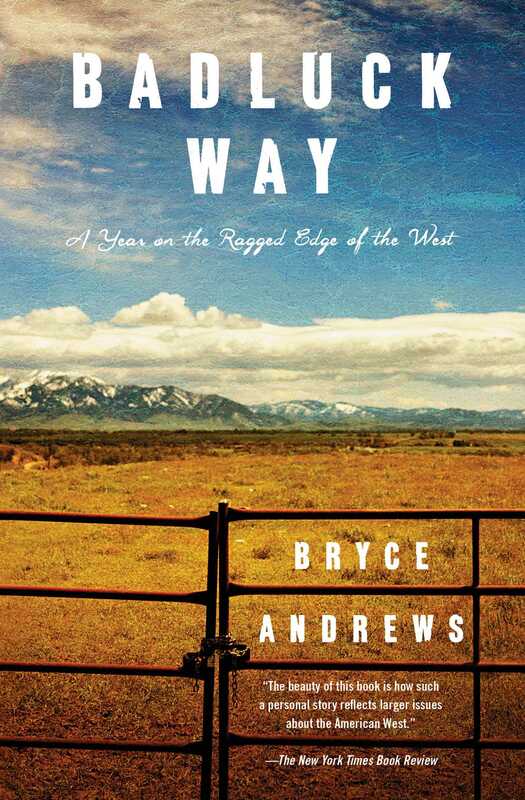 Badluck Way: A Year on the Ragged Edge of the West is a memoir of a young man firmly entrenched in many of the environmental issues facing our wilderness areas and consciences, all of it set against the biologically diverse, occasionally violent modern American West. 1. What was your reaction to learning that you would be reading a book about the ranching lifestyle in remote Montana? Are you at all familiar with that region of the country? 2. Before heading to Montana, Bryce suffers from a case of wanderlust, traveling through the United States and Mexico by train. Was there a point in your life where you felt similarly? Did this period lead you to any major decisions or revelations? 3. What do you think of the efforts and use of technology to prevent the wolves from attacking the herd? Are those efforts thoughtful and commendable, in spite of the fact that they fail to prevent conflict and violence? Can you suggest any new measures or strategies? 4. Consider Bryce and his colleagues’ daily duties as well as some of the atypical projects. Could you keep up with the Sun Ranch staff? What tasks do you think you could carry out, and maybe even enjoy? 5. Later in the book, Bryce and another Sun Ranch employee take a paying client on an elk hunt. How do you feel about that hunter’s interaction with his quarry and the land? Is such hunting ethical? Why or why not? Contrast that hunt with the hunting Bryce engages in as well as your own definition of hunting. 6. Animals such as wolves and grizzlies were protected by the 1973 Endangered Species Act, although wolves as of this writing have been delisted. As a result of the protection afforded by the 1973 act, their populations have regrown. What do you think about the debate over overhauling the act? Consider this article from the Denver Post, and others like it. 7. Many of the core principles at Sun Ranch concern sustainability, but ultimately the ranch itself is not financially sustainable. What was your reaction to Roger’s three-point plan and his statement that “A place like this can’t survive by breaking even on cows” (p. 131)? Are you familiar with any places that operate on a similar plan, one involving ranching/farming, ecotourism, and real estate? 8. How do you feel about the decision to get two kill permits for the wolves (p. 167)? Was this necessary to save the herd? 9. Part of working the ranch is protecting the herd and, if warranted, killing a predator that threatens it. Was it surprising to see Bryce feeling remorseful after he shoots the wolf? Did he have any alternative? Is it a feeling that might abate over time as he gets more accustomed to protecting a herd and ranch life? 10. Ranchers/farmers sharing the land with predators is a conflict as old as time. As resources and wilderness become scarcer, the conflict intensifies. Do you think there is any chance that common ground can be reached? 11. In the book and later interviews, Bryce asserts that wolves and cattle can share space, though the balance is sometimes a bloody one. He contends that wild creatures and livestock share a common dependence on open, ecologically intact landscapes, and that irresponsible development is one of the great and pressing threats to the American West. How do you feel about this statement? Have you watched the land around your hometown change? Should we take action to forestall the development of our wild and fertile places? If so, how? 12. In the Epilogue we learn that Bryce earns a master’s degree in Environmental Studies and continues to manage ranches. Some further research reveals that he is working on a spread contaminated from mining waste as well as starting a ranching program with the University of Montana. Did you envision Bryce becoming a career rancher? 1. Visit a conservation site in your area––solo or as a group––and learn about local efforts to protect and preserve the land. Speak with a naturalist or ranger, walk the trails, and note any flora and fauna unique to the area. Take careful note of the ecosystem around you and how all the elements––landscape, animals, humans––interact and impact one another. Compare and contrast them with the methods employed at Sun Ranch. Although it’s unlikely your destination will be as vast as Sun Ranch, some of the conservation principles may be very similar. 2. The vivid, immersive descriptions of Sun Ranch and the rugged yet picturesque Montana landscape are just one of the strengths of Badluck Way. Find a favorite outdoor place or remember one from your past and write a paragraph or two about it to share with the group. Provide a sensory experience of your place: its sights, its smells, its climate, its meaning to you. If you like, mark a passage from the book to share with the group in conjunction with your own work. Even better, share a photo of your place. 3. A quick Internet search of “Endangered Species Act repeal” brings back a variety of opinions. Review some and, along with what you have learned from Badluck Way, craft an opinion in defense of the Act or arguing for its overhaul or outright repeal. Please be respectful of other people’s positions. Bryce Andrews was born and raised in Seattle, Washington. He studied at Whitman College and the University of Montana, and has managed several cattle ranches in the West. He lives in Montana. "An evocative, poetic account of rugged terrain, the men and animals who inhabited it, and the complex realities of sustainable agriculture." "Andrews paints the rural landscape with such precision that the land becomes its own character, and his story [is] a finely tuned love song for the West." “Lyricism draws you in close; blunt, raw honesty holds you there… For Andrews, the mystery, grace, intelligence, and humanness of the wolves is palpable in his encounters… Badluck Way recounts in visceral detail what it means to make a ‘living from a hard place’ and the immense privilege and sorrow accompanying the work. It’s a celebration of the merits of hard work and a tribute to a livelihood… Badluck Way succeeds as a portrait of stubborn grit and hard choices." “Lyricism draws you in close; blunt, raw honesty holds you there… For Andrews, the mystery, grace, intelligence, and humanness of the wolves is palpable in his encounters… Badluck Way recounts in visceral detail what it means to make a ‘living from a hard place’ and the immense privilege and sorrow accompanying the work. It’s a celebration of the merits of hard work and a tribute to a livelihood… Badluck Way succeeds as a portrait of stubborn grit and hard choice."